China’s religious discrimination against Muslims could make it deeply unpopular in Pakistan. The self-described “all-weather” partnership between Pakistan and China has its weak spots, as has been discussed in The Diplomat before. What is important about the relationship, setting it apart from Pakistan’s frayed alliance with the United States, is that Pakistanis have an overwhelmingly positive view of China on a personal level. According to Pew Research’s 2014 Global Attitudes Project, 78 percent of Pakistanis held a positive view of China (a slight decrease from 2012 and 2013 when 85 and 81 percent of Pakistanis held positive views of China). To compare, the United States comes up looking good in the eyes of just 14 percent of Pakistanis (a 3 percentage point increase from 2013). Beyond the strategic logic of China-Pakistan relationship, Beijing will find Pakistan a difficult ally to work with if it loses its grasp on Pakistani public opinion. So far, this hasn’t been a problem, but it might be in the future as an unintended consequence of Beijing’s repression of homegrown Chinese Muslims. Take for instance a recent declaration in Karamay, a city in China’s Western Xinjiang province. 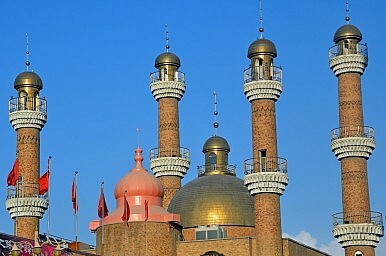 In a misguided attempt to thwart a terrorism problem that China primarily associates with the country’s Muslim Uyghur population, the city of Karamay banned “men with beards and women with Muslim headscarves” from using public transportation. Additionally, the declaration bans people sporting the Islamic star and crescent from using public transport (the star and crescent are part of the Turkestan flags used by certain Uyghur separatists). The policy will last for the duration of a sports tournament slated to take place in Karamay city and is not permanent, according to Foreign Policy. Nonetheless, the declaration captures the degree to which Chinese government hysteria about homegrown terrorism is leading to widespread religious intolerance in Xinjiang. Karamay, of course, is only the latest example of religious intolerance in Chinese policy. With mass arrests and raids occurring regularly, and with scant regard for actual intelligence determining the whereabouts of actual terrorists, China’s discrimination against its Muslim population is growing. The domestic consequences of China’s policies are controversial, with some indeed arguing that China breeds instability within its own borders through its misguided attempts to combat Uyghur extremist groups such as the East Turkestan Islamic Movement (ETIM). Slowly, China’s commitment to stabilizing its own restive provinces is beginning to affect its foreign policy. In 2014, China has publicly spoke with leaders from both Afghanistan and Pakistan about concerns that Uyghur separatists are using the mountainous terrain of the Wakhan Corridor and the Karakoram region to regroup and stage attacks against Chinese populations. While the governments in Kabul and Islamabad have expressed interest in complying with Beijing’s request to better monitor their northern borders, China faces the prospect of alienating the Pakistani and Afghan public with its policies of religious intolerance. China's solar industry has made great strides, but national priorities continue to be undermined by local realities.